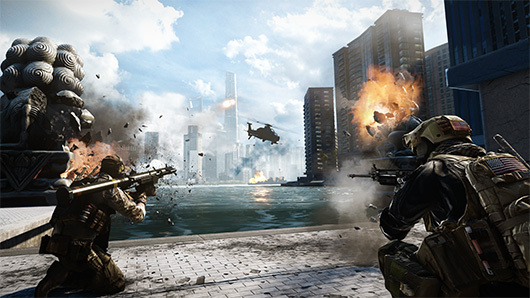 The chaotic, virtual warfare of Battlefield 4 is about to grow more organized with tomorrow’s addition of platoons. Despite the thematically-appropriate name, these platoons are best thought of as the Battlefield 4 equivalent of officially supported online clans. Up to 100 soldiers can join a given platoon where they will share a unique name tag and emblem with their fellow grunts. A private Battlelog feed will be available to each platoon, alongside a public feed useful for kicking off fights with other other groups of virtual soldiers. Developer DICE also notes that each member will have the “ability to earn stats for your platoon and rank it up,” though those ranks are ornamental and offer no tangible reward beyond bragging rights. Hoping to avoid another Battlefield 4 server crush, DICE plans to roll out platoon support gradually over the course of a week. Both Premium and Standard iterations of the game will receive the feature at the same time, though a Premium membership and a rank of at least 10 will be required to create your own platoon.